Mercury Poisoning is the accidental or intentional intake of compounds containing mercury and/or its organic and inorganic salts. The source of mercury exposure may be wide-ranging and includes exposure to volcanic ashes, coal-based power station fumes, consumption of contaminated fish, use of various medications (such as laxatives and antimicrobial drugs), thermometers and batteries, etc. What are the Causes of Mercury Poisoning? What are the Signs and Symptoms of Mercury Poisoning? The signs and symptoms of Mercury Poisoning can vary from one individual to another. It may be mild in some and severe in others. Several systems of the body may be affected. The poisoning may occur due to swallowing or inhalation of the compound. Children are severely affected from than adults, especially if the element is inhaled. 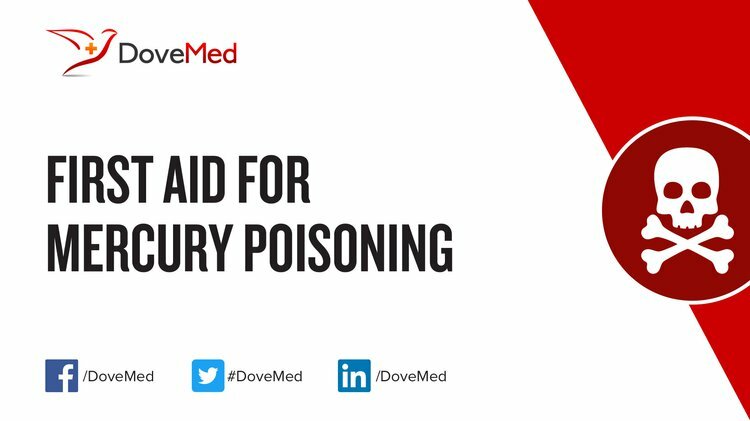 How is First Aid administered for Mercury Poisoning? Who should administer First Aid for Mercury Poisoning? First aid for Mercury Poisoning is administered by healthcare professionals. What is the Prognosis of Mercury Poisoning? How can Mercury Poisoning be Prevented? Rafati-Rahimzadeh, M., Rafati-Rahimzadeh, M., Kazemi, S., & Moghadamnia, A. A. (2014). Current approaches of the management of mercury poisoning: need of the hour. DARU Journal of Pharmaceutical Sciences, 22(1), 46. Vearrier, D., & Greenberg, M. I. (2010). Care of patients who are worried about mercury poisoning from dental fillings. The Journal of the American Board of Family Medicine, 23(6), 797-798. McNutt, M. (2013). Mercury and health. Science, 341(6153), 1430-1430. Tezer, H., Kaya, A., Kalkan, G., Erkocoglu, M., Ozturk, K., & Buyuktasli, M. (2012). Mercury poisoning: a diagnostic challenge. Pediatric emergency care, 28(11), 1236-1237. Peregrino, C. P., Moreno, M. V., Miranda, S. V., Rubio, A. D., & Leal, L. O. (2011). Mercury levels in locally manufactured Mexican skin-lightening creams. International Journal of Environmental Research and Public Health, 8(6), 2516-2523. Gul Oz, S., Tozlu, M., Yalcin, S. S., Sozen, T., & Sain Guven, G. (2012). Mercury vapor inhalation and poisoning of a family. Inhalation toxicology, 24(10), 652-658. Larson, H. J. (2014). The Minamata Convention on Mercury: risk in perspective. The Lancet, 383(9913), 198.